Collards belong to the Brassica, making it an excellent choice in the cooler months. Although it was once called colwort, or “cabbage plant” collards do not have compact leaves that form a head like cabbage does. Collard’s blue green leaves are broad and smooth in texture. Collard’s leaves lack frilled edges like kale and mustard greens. Collard greens are commonly seen in traditional southern and Creole-style cooking, but are also enjoyed in Portugal and Brazilian stews and soups, where they are paired with fish and pork. Look for collard greens that have firm leaves. Smaller leaves will be tender and have a milder flavor. 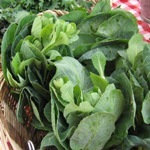 Collard greens should be washed very well since the leaves and stems tend to collect sand and soil. Before washing, separate the leaves. Place the collard greens in a large bowl of tepid water and swirl them around with your hands. Remove the leaves from the water, empty the bowl, refill with clean water, and repeat this process until no dirt remains in the water. Store unwashed collard greens in a damp paper towel in a plastic bag. They should be placed in the refrigerator crisper where they will keep for up to five days. Cook collard greens by sautéing, braising or steaming and try them with a side of black eyed peas and a bowl of Cajun rice.